Yale’s Robert Shiller used his occasional Sunday New York Times column this week to dive deeper into the risk sharing issues at hand in the debate about public employee pensions. As I mentioned in a previous post, the idea of pensions as a risk sharing device is probably a fruitful line to pursue. Shiller hardly moves the ball, but the mere fact that someone of his stature and insight picked it up at all is encouraging. En route, Shiller mentions a paper by Henning Bohn of UC Santa Barbara. Two things to note about that paper… First, it’s less about risk sharing and more about arbitraging financial frictions. I suppose the two are closely related, but they sure sounds distinct. Second, and more importantly, Bohn’s paper is about the right level of funding for pension plans, and in no way takes a stand on the right valuation of the existing liabilities. Bohn’s claim is something like this: one should underfund a $100 liability by putting aside only $60. But even if you give him this point, that isn’t the same thing as saying that at $60 the pension is fully funded. The liability is still $100, and Bohn’s paper doesn’t contest that. He’s just saying it’s ok to underfund. As mentioned in my earlier post, these are two distinct points. Shiller ends the column with a plug for an idea he has been hawking for a while, GDP linked bonds. The idea sounds exactly right. But it hasn’t taken off–yet. Perhaps it will soon. Or perhaps the mechanics are just infinitely more difficult than it sounds like at first. Pensions and risk sharing and financial innovation are a hugely complex topic. The time scales are long and the actors involved encompass the whole body politic–born and yet to be born. Moreover, the issues to be settled are so vast that it is difficult to imagine any narrowly crafted contract — and all financial contracts are narrowly crafted, unlike a ‘social’ contract — could adequately express and delineate whatever consensus was achieved. This is where an attempt to address the problem from a purely technocratic, financial perspective, as Shiller’s proposed GDP bonds purport to do, is bound to miss the mark by a mile. The Wall Street Journal’s Andrew Peaple uses this morning’s Heard on the Street column to address the demand by some derivative dealers for a broad exemption to the new Dodd-Frank clearing mandate. The issue is how to deal with companies that operate both types of businesses–an end-user business focused on producing physical products, and a financial business including derivatives dealing. The law already exempts the former–under certain circumstances and provisos–but the whole point of the law is to bring the latter under appropriate regulation. What to do about companies that do both? In previous posts about the clearing mandate for OTC derivatives codified in the Dodd-Frank bill we have discussed the impact on end-users. Craig Pirrong (University of Houston), a specialist in the organization of exchanges and commodity markets, reviews our position in his blog Streetwise Professor. We seem to agree on two points. 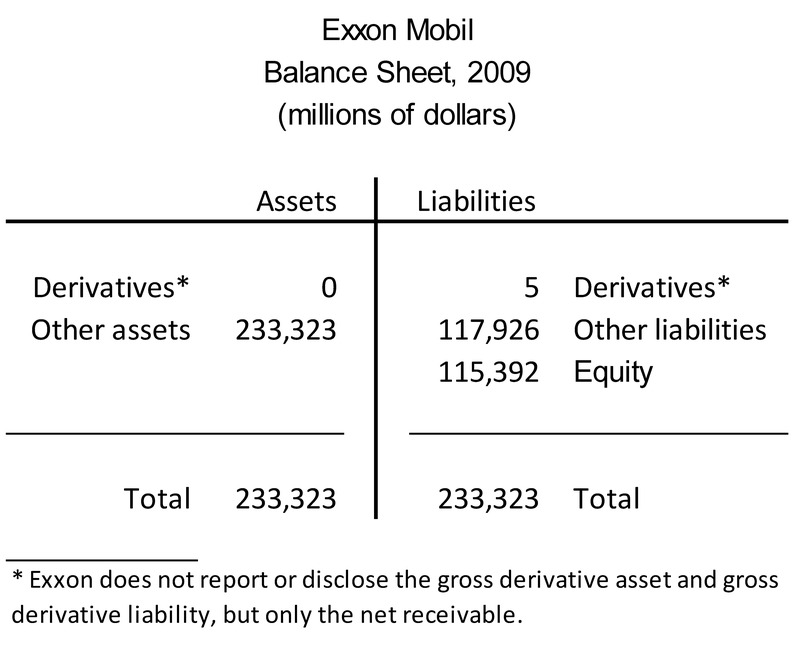 Exxon doesn’t use derivatives. At least not many of them. This is in strong contrast with a number of other oil majors that make active use of derivatives—for example, BP and Shell. This fact is a real puzzle for those who argue that companies should use derivatives to hedge the financial risks coming from their physical business. Since we are among the advocates of hedging, we take the puzzle seriously. We’ll come back to that shortly. This fact also stands as a rebuke to some of the opponents of reforming the OTC derivatives markets who misrepresent the connection between derivatives trading and the physical business of many end-user companies. More on that later, too. A new report by Dean Baker on “The Origins and Severity of the Public Pension Crisis” is getting a lot of attention. It’s hard not to notice that public employees’ pension benefits are under attack. Baker’s piece is a thoughtful look into the numbers and the economic forces behind the numbers, and they make a useful contribution to an informed approach to the issue. However, while he gets some things right, he gets one thing wrong, and it is useful to separate the wheat from the chaff. Baker makes essentially three points about the shortfall between pension assets and liabilities. One is about looking back, to see how we got here. A second is about where we are now, assessing the true size of the current shortfall. The third is looking forward, to see what it will take to remedy the situation. One of the central goals of Dodd-Frank is to redirect much of the OTC derivatives market through exchanges, electronic trading platforms and central clearinghouses that stand behind dealings in derivative contracts. “What that means to the American public is it’s less likely that the taxpayers stand behind that transaction,” [Gary Gensler] said. Gary has a magic box, called a “clearinghouse.” You put counterparty risk in the box, and it disappears! The Archer Daniels Midland company issued a press release Thursday announcing that Fortune magazine has ranked it the world’s most admired company in the food production industry. By the way, alongside all of that food production they do, ADM has a financial subsidiary. Not that they hide it. It’s right there on the web-site under the tab “Financial Subsidiaries”. 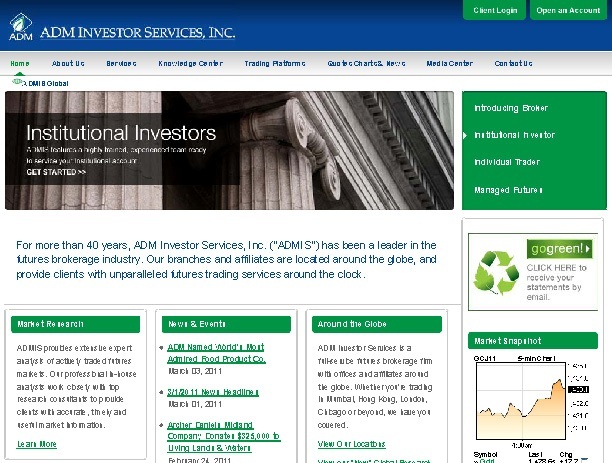 Correction: The original version of this post used the phrase “Derivatives Dealer” in the title instead of “Bank” and said that ADM’s financial subsidiary “deals derivatives.” Both ADM’s website and its 10K straightforwardly declare that ADM operates a financial subsidiary, and the services offered clearly touch the derivatives markets. But the term ‘dealer’ is term of art, even if one that has different meanings in different contexts including now a legal context. I have no personal knowledge of ADM’s specific activities beyond the website or 10K, so it was sloppy on my part, and potentially misleading, to attach the specific term ‘derivative dealing’ to the broad category of financial services ADM offers. I owe thanks to the pair of readers who called my attention to this. Since the original purpose of the post was to highlight the fact that a number of end-users operate financial businesses alongside their physical business, and since the specific type of financial activity is irrelevant to that point, I corrected the phrasing of the post. Gregory Meyer at the Financial Times does some helpful reporting on the different strategies being pursued by commodity companies in the fight over the regulations being written to implement the Dodd-Frank reform of the OTC derivatives markets. Companies including Cargill, Shell, Hess and Land O’Lakes produce, process, and ship physical commodities, and they trade financial derivatives to hedge commercial risk stemming from that business in the physical commodities. These are all activities covered by the end-user exemption written into the legislation. But many of them also operate a swap dealer business, selling financial derivatives to other companies, making financial markets, and betting money on their own proprietary trading portfolio. This is the activity that the legislation did not exempt. This is the dangerous loophole I was referring to in the quote in Meyer’s piece. Once written into the regulations, any financial firm could take advantage of it by starting a physical business alongside its financial business. It’s as if a cell phone company wanted exemption from cell phone regulations because it’s product contains a camera and so is not a cell phone. The regulator should not care about the camera. They should care about the cell phone. If the product makes calls on a cellular system, it’s a cell phone and, in that capacity, it should be subject to the regulations governing cell phones. What else the product does is beside the point. On the same principle, the same regulations should apply to swap dealer businesses, whether they come as a stand-alone business or wrapped together with a physical commodity business operated under the same corporate parent. Until recently, Shell and similarly situated companies have refused to acknowledge any of this, and they have had some success in framing the public debate as if a company was either (i) in the physical business — aka an end-user, or (ii) in the financial business — aka a swap dealer. They have refused to acknowledge that a company can be both, and they hoped to shape the regulations to align with this unreal framework. Along comes Cargill to finally acknowledge the obvious. Cargill is a big end-user. And Cargill runs a swap dealer business. They do both. Cargill’s realism is a breath of fresh air. How to write the regulations to respect the distinctions within a company is a difficult task. But we can only get started if we begin with a realistic perspective. In that respect, Cargill has done the public discussion a useful service.